A group of four men sitting cross-legged beneath a large tree, one with a French rifle across his lap and ammunition around his waist, and several spears leaning against the tree. 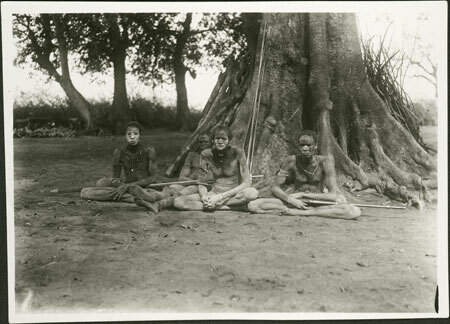 The photograph seems to have originated from Talib Ismail, a sub-mamur at Akobo in the Upper Nile Province 1920-27. Morton, Chris. "Nuer men " Southern Sudan Project (in development). 03 Jan. 2006. Pitt Rivers Museum. <http://southernsudan.prm.ox.ac.uk/details/1998.346.350/>.